Prinsip Mahir Sdn Bhd can offer a comprehensive and cost-effective solution to your training needs, whether you are small or large, local or multinational organization. Our comprehensive training portfolio continues to keep pace with industry developments and anticipate user demand. The training courses reflect management, manufacturing and quality best practices, designed to help your people build their skills and apply their knowledge more effectively in the workplace - we can deliver precisely the training you need for implementation, transition or auditing of your Management Systems in compliance to ISO requirements. 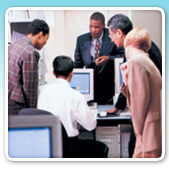 We utilize a combination of training an consulting, customized to the unique requirements of each situation. We place emphasis on working towards empowering our client's staff to be self-sufficient, and to take ownership of the implementation of the change process. Our trainers not only have industry and subject expertise, they also stand out because they understand how best to help people learn; they are memorable tutors with excellent people skills.